Was watching several YouTube videos about kids playing old NES games and something struck me. These kids sucked at old games which should have been easier to play. Only eight directions on the gamepad, two buttons, A or B, and yet they lacked decision making. Three games, Contra, Mega Man and Super Metroid the kids all did the same thing. They started running around until they ran into enemies and, logically, they had no idea what to do. It took some several minutes to even figure out they could shoot back. Sadly it was a demonstration of the poor problem solving abilities of children. More than one even mentioned how much harder they were then today’s games which guide the gamers by the hand though the game. Games back then, you had to figure out what to do. This brings up education. Are children being taught how to problem solve? Common Core would say yes, but are they? 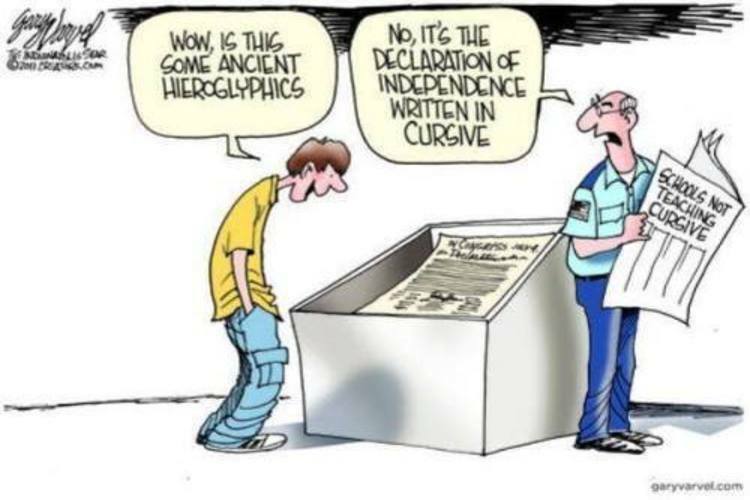 Look at cursive being taught in schools. Some are starting to say that writing in cursive stimulates the brain. I have run across kids who didn’t know how to read cursive, it was a sad day. These kids are growing up and not learning how to problem solve large problems and used to getting everything hand fed to them. No wonder they think Sanders and socialism is a great thing.